ABOUT NOTTINGHAMSHIRE: ITS PLACES AND ITS PEOPLE, by CORNELIUS BROWN, F.R.S.L., author of "LIVES OF NOTTS. WORTHIES" and other works. WINKBURN PARK AND HALL—AN ANCIENT CHURCH—MEMORIALS OF THE BURNELL FAMILY—ELIZABETH COUNTESS OF RUTLAND AND HER WlNKBURN CORRESPONDENCE— NOTTS. LADIES AND THE VIRGINALS—DIFFERENCES WITH QUEEN ELIZABETH. Winkburn Hall dates from the late 17th century; the attic storey was added in the late 18th century (photo: Andrew Nicholson, 2003). We pass on therefore without further delay to Winkburn, and the drive through the park is again one of unusual beauty. The country is well wooded and undulating, and the scenery is very picturesque. Winkburn lies in a pretty valley, watered by the river Winkle, the central points of interest being the venerable church, and the hall dating from the last century, which are side by side, forming a happy combination of the ancient and the modern. 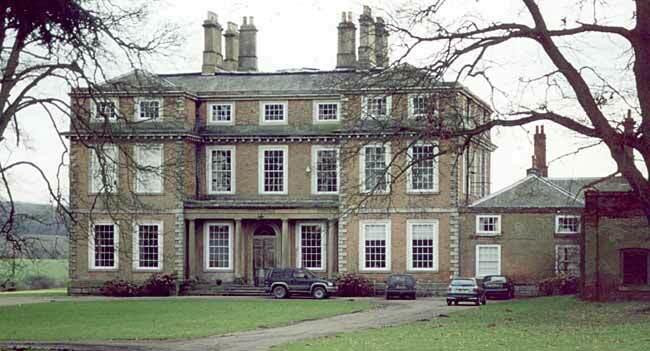 The mansion of, brick, the abode of Col. Burnell, J.P., has a pleasing elevation, and the park and grounds which it overlooks are of considerable extent. The winding footpath to the church is through a maze of trees, and we are beneath a leafy canopy nearly all the way from the street to the sacred edifice. With the sun glinting between the leaves, and the birds singing in chorus overhead, the road is pleasant enough, and an abrupt turn in it brings us face to face with the ancient structure, thickly covered from floor to roof with a garment of clinging ivy. The south doorway is clearly Norman, and the distinctive characteristics of the architecture of the period may be seen in the arches and in the low tower; the walls of which are very strong and massive. Within the church are the high backed pews so familiar half a century ago, and a large oak pulpit with its wooden canopy stands near the middle of the nave. Only a narrow passage separates the north side of the church from the hall, and there is a small doorway through which entrance can be effected. The sacred edifice possesses many features of interest, and several memorials to departed worthies who have worshipped within its walls. Some time in the twelfth century both church and town of Winkburn were given to the Knights Hospitallers of St. John of Jerusalem, one of the military orders of the religious who were introduced into this country about A.D. 1100. The Hospitallers took their name from a Hospital built in Jerusalem for the use of pilgrims coming to the Holy Land, and their duty was to provide for such pilgrims, and to protect them from injuries and insults upon the road. They followed the rule of St. Austin, and wore a black habit with, a white cross. Rich gifts were made to them, and they became in course of time a very wealthy and powerful body. There was no preceptory in this county, but several in Lincolnshire and Yorkshire, including one at Eagle, close to the borders of Notts. To these institutions the revenues of land, given by benefactors, were devoted, the proceeds of Winkburn going to a preceptory at Newland in Yorkshire. The Knights retained possession until the seizure of monastic property by Henry VIII., when Winkburn reverted to the crown, and was granted by Edward VI. to William Burnell, Esq., and Constance, his wife, with whose descendants it still remains. By the side of the south wall of the chancel is the tomb of this gentleman, having on the upper slab an incised figure in the garb of a civilian, with hands crossed, a Latin inscription stating that he died September 23rd, 1570, aged 56 years, and the Burnell coat of arms—a lion rampant crowned, within a bordure. "Onto her Majesty I am most highly bounden, acknowledging her Highness the very fountain from whence only cometh all my good"; and she loyally presents her humble duty "as from her who desireth not to lyve but to do her Majesty service, and never wisheth more happiness than the conteynewance of her Highness's favour." But affairs of the heart upset the friendly and cordial feeling between Sovereign and subject. The Lady Bridget contracted a secret marriage without Elizabeth's consent, and so brought down upon herself and her mother the full weight of the Royal displeasure. An official letter says "the gentleman is lyk to be imprisoned, and my Lady Bridget must also be comytted, only her Majesty vouchsafeth this grace, that she shall not be sent to a prison, but comyttsd forthwith to custody of some lady, but where is not resolved. What more may follow God knoweth, for her Majesty is highly offended and principally against your Ladyship without whom she assureth herself this would never have been done and letteth not to say that your Ladyship was bold to do it." But by degrees the Royal wrath abated so that no further ill consequences than a brief commitment ensued. Meanwhile the countess left Winkburn to return to Belvoir, and so passed beyond the locality with which this present article deals. Monument to William Burnell (photo: Andrew Nicholson, 1988). So great a time; few great ones him outstepped. And unto Wombwell, an Esquire, Olive. And six children when he left this life. Obiit 2 April, Ano. Dom. 1609. Two other striking memorials remain to be noticed. 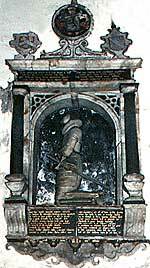 One is a fine marble monument to D'Arcy Burnell, Esq., who died in 1774, aged 46. It is surmounted by life sized figures of an angel with a torch that has been extinguished, and a lady gazing sorrowfully at the portrait of her lost lord. Another interesting memorial is a beautiful brass on the north wall to Hugh Darcy Pegge Burnell, Col., commanding 7th Queen's Own Hussars, born 16th July, 1836, died 18th December, 1883, erected in loving memory by the officers and non-commissioned officers who served with him in the regiment. On the brass is inscribed Dettengen, Peninsular, Waterloo, and Lucknow, with the monogram of the regiment above and the arms of the Burnell family below.